David W. Stockton, M.D., F.A.C.M.G. Based on: The revised Ghent nosology for the Marfan syndrome. by Loeys BL, Dietz HC, Braverman AC, Callewaert BL, De Backer J, Devereux RB, Hilhorst-Hofstee Y, Jondeau G, Faivre L, Milewicz DM, Pyeritz RE Sponseller PD, Wordsworth P, De Paepe AM. Journal of Medical Genetics 47: 476-485, 2010. The 1996 Original Ghent Criteria checklist is also available. first degree relative who independently meets the diagnostic criteria. * Without discriminating features of SGS, LDS, or vEDS AND after TGFBR1/2, collagen biochemistry, COL3A1 testing if indicated. Unlikely diagnosis of Marfan syndrome. 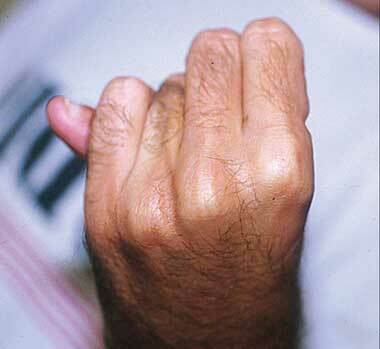 wrist sign - thumb overlaps the distal phalanx of the fifth digit when grasping the contralateral wrist. thumb sign - entire nail of the thumb projects beyond the ulnar border of the hand when the hand is clenched without assistance. See the images reference page for examples and explanations.